Arrive in Dublin and enjoy a private transfer to the centrally located Westbury Hotel. After lunch, visit Trinity College and see the Book of Kells. 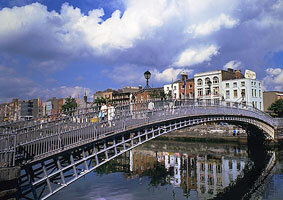 Enjoy a lovely afternoon at the James Joyce Center and a visit to the Dublin Writers’ Museum. After a full Irish breakfast, depart on an excursion to County Wicklow, taking in the monastic sites and lake at Glendalough followed by a visit to the Avoca Hand Weavers. En route back to Dublin, stop in Sandycove to visit Martello Tower and Joyce Museum. Depart Dublin this morning after breakfast and head to Sligo in the northwest. Visit local literary spots along the way to learn about local writers and poets. Have lunch at a local pub en-route. Visit the Famine Museum in Roscommon to learn about the events of the 1840’s that gave rise to mass immigration from Ireland to the U.S. Continue to Cromleach Lodge for a 2-night stay. Sligo, home of William Butler Yeats, is aptly known as Yeats Country. His brother Jack B. Yeats is one of Ireland’s most famous painters whose works go for seven and eight figures. Visit Lissadell House where Yeats lived and wrote much of his work. 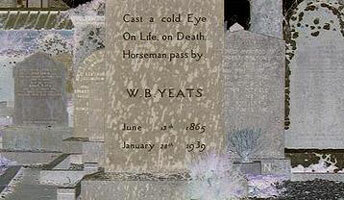 Carry on towards Drumcliff, the churchyard where Yeats is buried and where you may read his epitaph: “Cast a Cold Eye on Life, On Death Horseman Pass By!” Yeats asked to be buried “Under Bare Ben Bulben’s Head,” the table mountain that can be seen for miles. Afterward, visit Glencar Waterfall and the Lake Isle of Innisfree. Visit many ancient ruins throughout the beautiful Sligo countryside. Depart Sligo and head south through some beautiful Mayo country-side and visit the planned town of Westport, home to Matt Molloy, the flautist of the Chieftains. You can see Clare Island in the bay, once home to the infamous pirate queen, Grace O’Malley. Continue south via the spectacular Delphi Valley to Clifden. After lunch and more exploration, continue through Connemara to see the Twelve Bens, thatched cottages, and stone walls before arriving in Galway for a 2-night stay the Twelve Hotel. This morning visit Coole Park, which has deep literary connections with Shaw, Yeats, Synge, Gregory and O’Casey to name a few. Enjoy the afternoon in Galway City, exploring, shopping and sightseeing. There are many great pubs and restaurants in this attractive university town, well known as the literary and drama capital of the west. 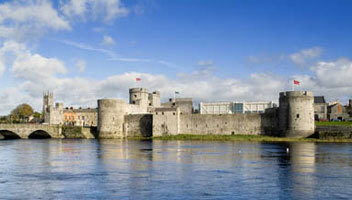 After breakfast this morning head into Limerick for an enjoyable day, including a tour of King John’s Castle. See the famous Treaty Stone and visit St. Catherine’s Cathedral. Enjoy a literary walking tour of Limerick, made famous by Frank McCourt.